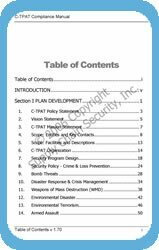 Supply Chain Security, Inc. has developed hundreds of written security programs for its clients using this table of contents as a model. Our manual offers you the opportunity to develop your own program components while guiding you in setting site-specific policies that are perfectly suited to your workplace. Reviewing the specific elements that are addressed under each section will give you a clear picture of the detail and scope of our manual. Each subject was carefully selected, researched and discussed in an effort to offer you the best guidelines possible.